Today Ed got the phone call that he's officially logged ONE MILLION MILES with the company he's currently leased to and will be awarded their Million Mile Safe Driver Award. These are not his lifetime miles, as he's driven over two million total miles, these are just the ones with this company; and in case you're wondering, driving a million miles is equal to 357 trips from New York to Los Angeles or two round trips to the moon. The Million Mile Safe Driver honor comes on the heels of his 10-year Safety Award - driving ten years with no accidents or moving violations - for which he was given the recent cruise we just went on. 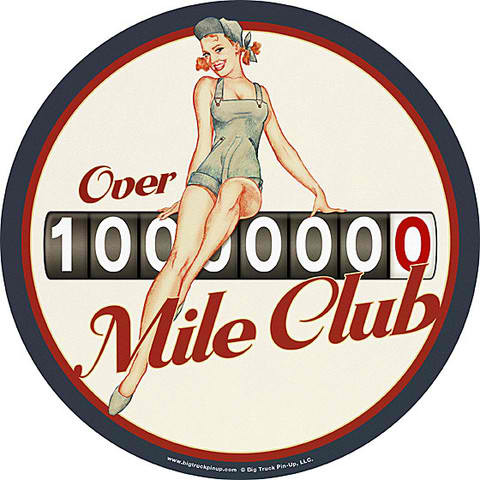 The Million Mile Award is a little different in that it's given to drivers who have driven more than one million consecutive miles without a preventable accident. These are miles that Ed has documented in a manner that's checked and double-checked. And they take this stuff seriously. If Ed had gotten in an accident at 998,000 miles, they wouldn't have just overlooked it, he would have had to start over. I know this because out of curiosity, Ed called and asked. Can you imagine what it would be like to get to that point only to lose it all?? I bristle at the thought. So the call he got today was to congratulate him, and extend an unofficial invitation to the awards ceremony which will be held in Florida to formally recognize him for his accomplishment. They will send an official invitation in the mail. Driving millions of miles is not unusual for a career truck driver, but driving without preventable accidents is an incredible achievement. People who do this set the standard for safe driving. They are exceptional at what they do. Protecting your driving record is a daily challenge considering outside forces (other drivers) can contribute to you losing the record you've worked so hard to maintain. In a split second, through the actions of a complete stranger, you can lose the ability to say you've gone millions of miles accident free. Out here, a good record means everything. It's what you're judged by, it's how you're hired, it's what keeps you on the road making money. I'm very lucky to have the honor of riding in a truck with a person who has protected his driving record like a Catholic girl used to protect her virginity. Fiercely. I feel safe whenever he's behind the wheel and other people should feel safe having him on the road beside them. It makes me extremely proud to be able to share his accomplishment. Congratulations to my Eddie for this trucking milestone! I look forward to the next million with you. Congrats to Ed. I would not want to know when there is just a few miles left....deer would come out of the sky! lol My company says deer hits are a preventable. I am on my third year with no preventables,knock on wood. My first year had a drunk driver come head on in my lane. It was 100% unpreventable. I had to turn the tractor off the road. Woohoo. This is an incredible achievement because with only five years under my belt, I can tell anyone, it's a crazy world on the highways and byways of North America. Congratulations Eddie. I wonder if Landstar consders a deer strike preventable because there seem to be a million out there! Fantastic achievement. Skill and vigilance to the max, considering what's out on the roads. Deer insurgents and human accident commandos. Many congratulations, and you should get at least a cruise for this. Congratulations Ed! I don't think I'd come close if I added up miles I put on all my cars through the years. Congratulations Ed, what an accomplishment. You should have some kind of sign on the truck. Dee its true, there are different things that happen out on the road that are out of our control, but a deer running wild in front of a truck out of nowhere should be non-preventable. Thanks to everyone for the kind words. As I have learned from people far older and wiser than I am, it's not what you have done in the past, it's what you are going to do today that matters so I will just keep working to keep the safety streak going. For the amount of driving I've done my entire life, I'd have to be a million years old to accomplish what you did. Bravo my favorite one!